You deserve a kitchen that reflects your personality. Why not start with this stylish and durable Vigo faucet for your sink. Stainless steel finish with matching deck plate all solid brass construction which ensures durability and longer life. Faucet features single function pull-out spray head with power spray. Includes a spray face that resists mineral buildup and is easy-to-clean. 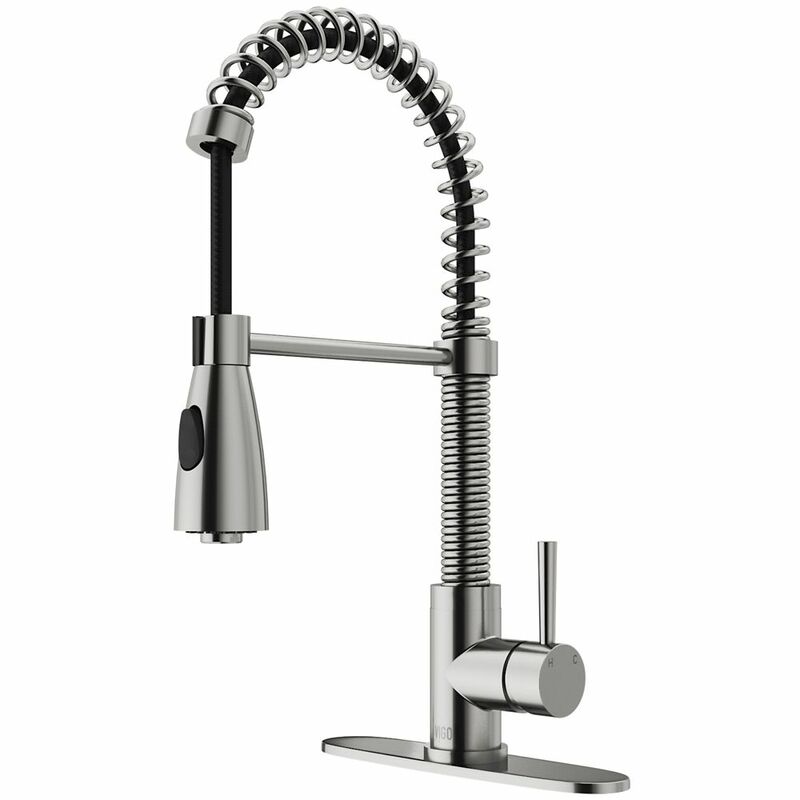 Brant Stainless Steel Pull-Down Spray Kitchen Faucet with Deck Plate is rated 4.8 out of 5 by 78. Rated 5 out of 5 by okerij from Perfection! I purchased this faucet online about six weeks ago when I bought my first home. I love to cook so my kitchen is very important to me. I couldn’t be happier with this faucet! Besides being beautiful, it’s works like a dream - such high quality. Everyone who’s visited comments on how “cool” it is. I highly recommend! Rated 5 out of 5 by JLaWhitt from Love it Looks great, works great! I'm very pleased with this purchase. Rated 5 out of 5 by Stujank from Great looking and easy to install! We purchased this 2 months ago, so we have had time to use it and evaluate it. It came quickly, and was packaged well. It was easy to install. Love the fact that the sprayer is larger than some others that have a smaller design. Also love that it converts the water back to a steady stream once the faucet is turned off then on again. We feel that we made an excellent choice! Rated 5 out of 5 by HomeDepotCustomer from My Vigo pull-down sprayer faucet is a wonderful utility in... My Vigo pull-down sprayer faucet is a wonderful utility in my kitchen and no probables to installtion. I would recommend this faucet to anyone looking for a sturdy and economical compared to other more expensive manufacturers. Rated 4 out of 5 by Josh O from Love it! Just installed and couldn’t be happier thus far. Install was super easy and looks great! One issue I had was that the instructions didn’t show which way to install the initial plastic ring so I had to try both to ensure I hadn’t right. Rated 5 out of 5 by Faucet Rocks from Beautiful Fantastic looking; easy to o install,well made: nothing but compliments. Rated 5 out of 5 by Trackey from Pretty faucet I bought this 3 months ago, looks great works well.